Hello there. Fall is well under way and Halloween is fast approaching!! This month Eileen Hull's Inspiration Team is making all things related to the holidays, or "Fall-idays". Keep an eye on her blog to keep up on all the inspiration. 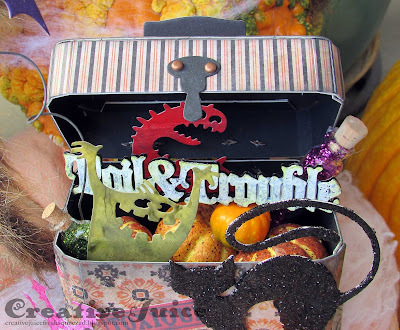 I used her Train Case box die to make a decoration bursting with Halloween festiveness. I love the Silly Monsters Die Set!! The train case die is easy to put together. 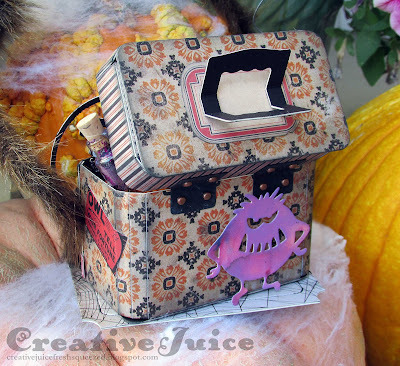 I covered the Sizzles matboard with patterned paper from Tim Holtz's Halloween Paper Stash. 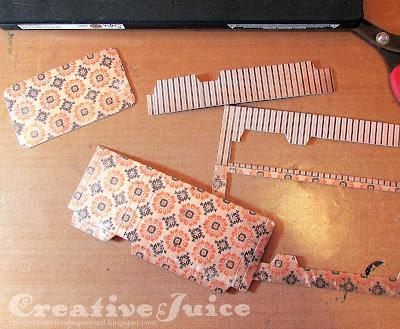 To save time and paper, I measured out where the die cut parts for the lid and body would fall and adhered my patterned paper accordingly. I used the Big Ticket die to cut a base for the Train Case to sit on. I filled the Case with pumpkins, monsters, vials of "potions" and other goodies. Thanks for stopping by! I'm also entering this into the October 'Freaky Fun' challenge over at Emerald Creek Dares. That is just so great! 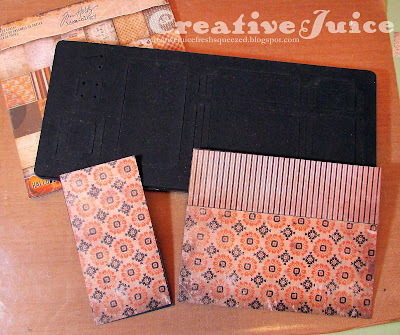 I love all the versatile ways you've been using Eileen's dies with Tim Holtz dies and products! These little monsters are starting to appear in all kinds of places stirring up trouble! Do you have a Pinterest page? My pinterest pin on my browser has been so glitchy lately, I can't even seem to connect to pinterest when I click on the big P logo over pictures on blog posts! I would love to find a way to add this to my Eileen Hull inspiration board! I have all sorts of stuff pinned there lol. This is fantastic! I love Eileen's dies. Paired with Tim's goodies and you have an amazing project! 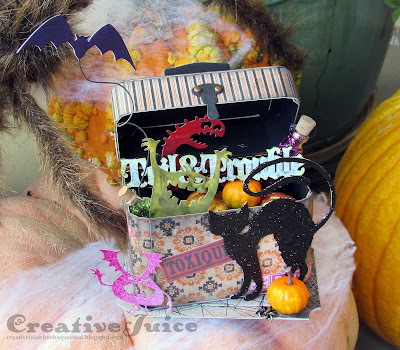 Fall Card on the AJVD Blog!